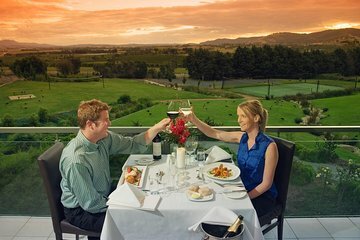 Experience the delights of the Yarra Valley with an indulgent 2-day spa break at the luxurious Balgownie Estate Vineyard Resort. Expand your knowledge of Australian wines with expert-led wine and Champagne tastings, enjoy a delicious lunch of regional specialties and make the most of the tennis courts, swimming pool and gym. For the full experience, add on a massage or spa treatment (own expense) at the Natskin Spa Retreat. This small-group tour has a maximum of 24 people and includes overnight accommodation and round-trip transport from Melbourne. Our bus diver was rude and condescending and made jokes at other people expenses. A shame as the driver was very knowledgable. For further reference when the overnight tour is offered in conjunction with the day tour, recommend the overnight tour travellers only have an overnight size bag, due to restricted luggage storage on bus. The wineries we toured we really nice. We chose the 2 day tour and stayed at the Belgownie Estate. Our room was spacious with a round Jacuzzi tub. We were able to get a couples massage at the spa and finished off the evening with a lovely meal. The wine guy Orle was there from France. His father owns a winery and Orle is working at wineries around the world to take back an experience at the family business. Nick our driver/guide was extremely knowledgeable, funny and went out of his way to make sure everyone had a great experience. I would highly recommend this tour.